Drywall anchors and hollow wall anchors are designed to bite into the anchoring surface material. Drywall anchors bite into the surface material inside a hole drilled into the surface. Expansion sleeves use ribs that expand into the surface material as a screw or nail is navigated further into the plastic sleeve. 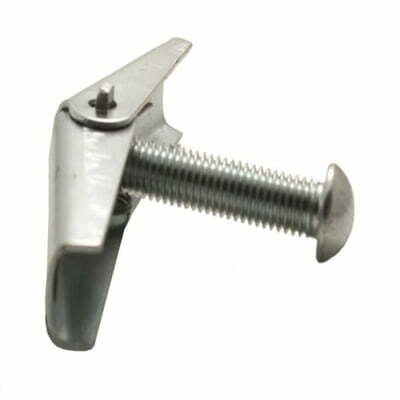 Threaded drywall anchors function much like a screw by including a cross-slotted screwdriver slot and deep threads that bite into the surface's core material. The best hollow wall anchors are toggle-anchors, which have wings that toggle open and bite into the back-side of the anchoring surface. Drywall anchors and hollow wall anchors are rated in shear and tensile strengths. Shear is measured by the weight the anchor can safely hold when the weight is applied parallel to the anchoring surface. Tensile is measured by the weight the anchor can safely hold when the weight is applied perpendicular to the anchoring surface. You should never exceed the strength ratings of the anchors and the anchoring surface.